A few days ago, I won a contest over at Cozy's Place (I love that name) by guessing Del's birthday: Dec. 12! And what an awesome prize! Look! 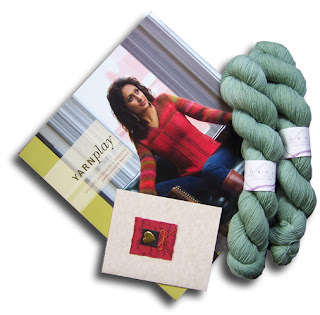 It's a copy of Yarnplay (I love Poppy, the cover sweater) and two skeins of Lorna's Laces Shepherd Sock. When I received it, it was beautifully packaged in my favorite colors: green and purple, and she had written the nicest note! Now I guess I'm going to have to knit some socks. You have to understand...my first sock experience was for my husband, and I've never recovered: size 13 on US 0 dpns. And he likes them ribbed all the way up. 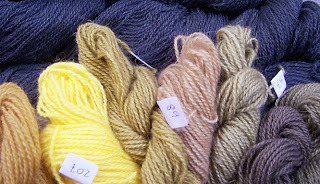 Three skeins of Jawoll. zzzzzzzzzzzzzz. But maybe I'll knit myself a little something this time. Like Pomatomas. I love that pattern! Thank you, Del! And Happy Birthday!!! On to my birthday report. A little late, but nonetheless, I have tales to tell! Before I go on here with the following yarn and book gluttony, you must know that I have been on a serious yarn and book diet for a little over a year. I'm a bit embarrassed at my riches here! 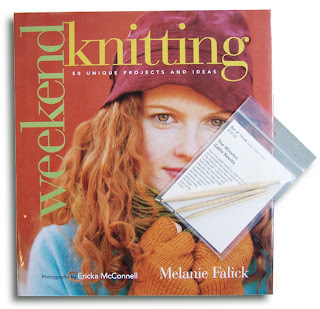 And those are some cool little wooden cable needles. I love this book. I want to do the Kristin Nicholas chair cushions. I am a huge fan of hers. I love her color sense. It is so totally and completely gorgeous! I love this book. 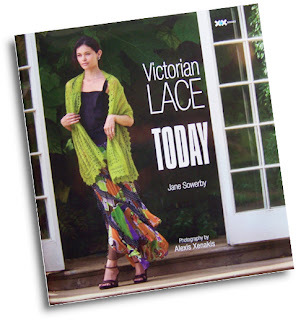 There are so many knittable patterns in it, and they all look so wearable the way they are photographed. I had to do a reality check on a couple of them (no, Rosemary, you don't look good in ruffles!) to keep myself from a cast-on mistake. 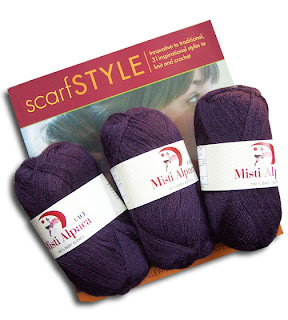 I plan to do the cover stole in the purple misti alpaca laceweight that a kind friend of mine gave me yesterday (I love stretching out my birthday!). And she gave me Scarf Style, because I think I may have been the last person on Earth not to own it! You can see it here, but it is a little difficult to navigate to the photo! 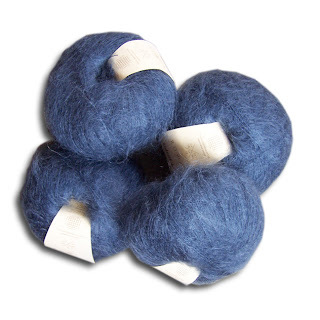 It is dyed by expert dyer Solveig Gustafsson and you can find more out about them here. You really can't appreciate the amazing beauty of this yarn from the picture. It is just incredibly decadent! I was (and am) completely overwhelmed by it! Yay! Happy (late) birthday, sounds like you had a great one! Whatta cutie you've got there, too. 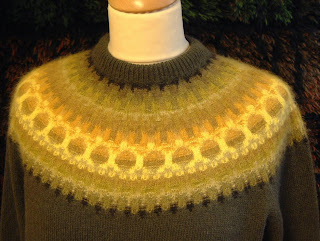 Wow, that Bohus sweater is lovely - can't wait to see yours. Glad to see you had a great birthday! Remy is just cute as a button! And those curls! Hee... "icingmanship." It's all in the flick of the wrist and a steady hand. I can also paint color on walls without masking and it'll come out straight as an arrow. It's a gift, I tell ya. Happy 8th day after your birthday, to yoouuuuuuuu! Holy cow! What a haul! And that picture of Remy is beyond adorable. You should have a caption contest for it. :-) So, what's the scoop on the magazine that you won? I haven't heard of it but the cover sweater is sweet. god. 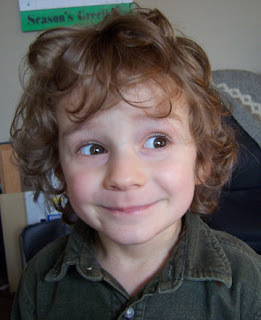 that is the cutest kid ever!